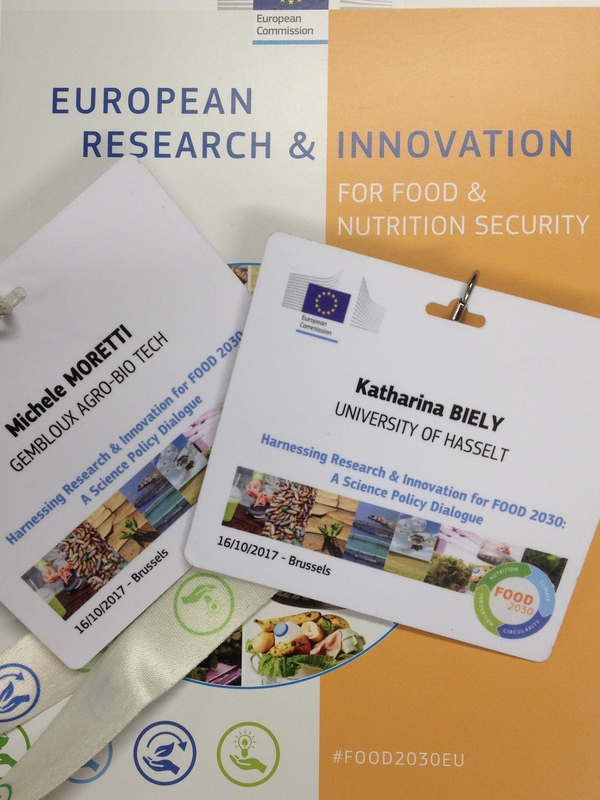 The European Commission organized the FOOD 2030 conference “Harnessing Research and Innovation for FOOD 2030. Science Policy Dialogue” which took place on the 16th October 2017. Kaharina Biely and Michele Moretti from the Environmental Economics research team were present to learn more about the role of research and innovation for agriculture. Both scientists focus on agriculture being engaged in research projects dealing with the agrifood sector (SUFISA and DESERT). The connection between agriculture and the Sustainable Development Goals (SDGs) was a main point of the conference. The SDGs set sustainability goals to be reached by 2030. While this seems to be in the far future John Bell pointed out that this is only 10 harvests from now. The SDGs are the sequel of the Millennium Development Goals (MDGs). Many goals were not achieved and the SDGs represent a renewed commitment by the global community to achieve certain goals. One of these goals is the eradication of hunger. While more innovation will (hopefully) assist in reaching this goal, Cristina Amaral made clear that it is not the lack of technologies but political will and cooperation that are needed to tackle this problem. Louise Fresco talked about the importance of technology for food security, expanding on precision farming and genetic modification. Moreover, she called for increased inclusion of science. Indeed, perceptions that are debatable. For example, what was missing in the conference was the role of farmers in the innovation process. While farmers were underrepresented the relevance of science and companies was emphasized. An example was Walter van Dyck’ talk about creative innovation referring to Schumpeter. He emphasized the relevance of large players as source for innovation. However, the issue of market power was note touched. Can we leave innovation to big players? Does this not increase dependence on them and lead to a further marginalization of farmers in the innovation process? Why are farmers not seen as a potential source of innovation, but rather as consumers of innovation? In the panel, it was asked whether there is a conjoint fight of businesses for a sustainable future. The answer was that competition is the principle force deciding upon the mainstreaming of innovations. However, if competition is the main determinant for the common application of innovation, how do we make sure that competition is fair and power imbalances are counteracted? Another main topic was the goal of increased efficiency. Tassos Haniotis stated that agriculture absorbs 40% of the EU budget but it contributes only 2% to EU GDP. But do these numbers indicate that agriculture is inefficient? Maybe this is the wrong question. The question may rather be whether these numbers make agriculture worthless? An interesting answer to this question was delivered in the session on climate change and environmental sustainability. Jacob Van Milgen indicated that art cannot be disregarded because it is not efficient. The purpose of art is not to be efficient. Thus, measuring the efficiency of art and drawing conclusions upon such a measurement is not helpful. There are many purposes of art and one can also say that playing an instrument or dancing has no goal. Rather it is the activity itself that lends value to them. Another example he brought up was the diet and metabolism of Pandas. While a Panda’s nutrition and metabolism may not seem to be very efficient, one has to take into consideration that this is the result of an adaptation process. Similarly, agriculture should not be reduced to efficiency measures. There are practices that may not be the most efficient ones, but are the result of an adaptation process, that allowed humans to strive in regions with adverse conditions. Moreover, agriculture may fulfill multiple purposes, that cannot be measured with efficiency. One example may be gracing cows in the Alps that contributed to the creation of a particular cultural landscape and ecosystems. This landscape is valued by many and used for recreational purposes. While we need to use our resources efficiently, now maybe even more than in the past due to the decline of the availability of resources, we must not reduce our worldview to efficiency measures. Once more a systemic perspective is needed that takes into account the broader picture. Robert Pederson offered an inspiring talk about it, by presenting the SoilCare project. He claimed that a long-term perspective on food systems is needed. This perspective cannot disregard the quality of resources: “good quality soils are essential to produce good food” (R. Pederson). The possibility to integrate resources’ bio-physical properties with farms’ profitability must be explored. Fostering farmers’ involvement in this effort will help to do so.